This morning we announced four new additions to our critically acclaimed line of St. Vincent Signature Guitars. Envisioned and designed by St. Vincent (Annie Clark) with support from the award-winning engineering team at Ernie Ball Music Man, the unique electric guitar pushes the boundaries of design with singular voice to match. As Premier Guitar put it, “Annie Clark’s signature model is visually striking, but its distinctiveness is more than skin-deep. It’s as bold, imaginative, and thoughtful as Clark’s extraordinary guitar work.” The new St. Vincent Signature Collection will be available for pre-order on March 3rd in four bold new colors: Stealth Black, Tobacco Burst, Heritage Red and Polaris White. Featuring an African mahogany body, Ernie Ball Music Man tremolo, gunstock oil and hand-rubbed rosewood neck and fingerboard, St. Vincent inlays, Schaller locking tuners, 5-way pickup selector with custom configuration and 3 mini-humbuckers, the guitar also comes complete with Ernie Ball Regular Slinky guitar strings and will retail for $1899. January 25th sees the release of the Sterling By Music Man model, which is available in the original Vincent Blue for $599. 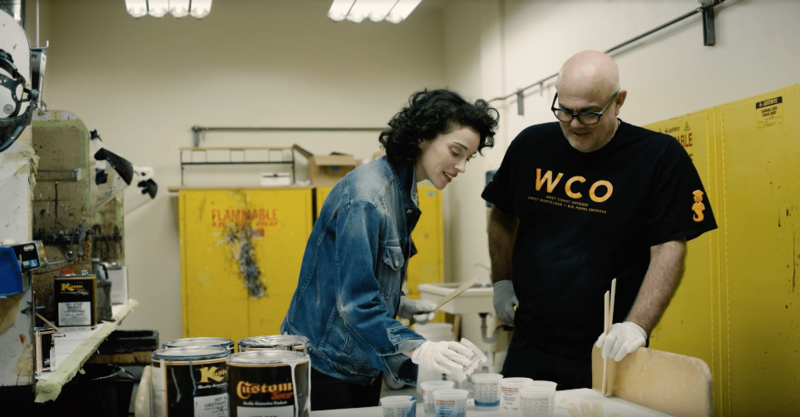 We’ve got behind-the-scenes footage from the Guitar World cover shoot, as well as exclusive footage of St. Vincent talking about the guitar at the Ernie Ball Music Man factory in San Luis Obispo, CA. It’s also important to note that the St. Vincent guitar is by no means a US-only phenomenon. Outlets from around the globe have been praising the collection, such as Poland’s Gitarzysta (Guitarist) magazine. They recently awarded the St. Vincent guitar their first-ever perfect score of six stars across the board, in categories measuring playability (wygoda gry), tone (brzmienie), quality (wykonanie) and price (cena).